Vectorial Elevation was a large scale interactive installation that transformed Mexico City’s historic centre using robotic searchlights controlled over the Internet. Visitors to the project web site at design ephemeral light sculptures over the National Palace, City Hall, the Cathedral and the Templo Mayor Aztec ruins. The sculptures, made by 18 xenon searchlights located around the Zócalo Square, could be seen from a 15 kilometer radius and were sequentially rendered as they arrived over the Net. The website featured a 3D-java interface that allowed participants to make a vectorial design over the city and see it virtually from any point of view. When the project server in Mexico received a submission, it was numbered and entered into a queue. 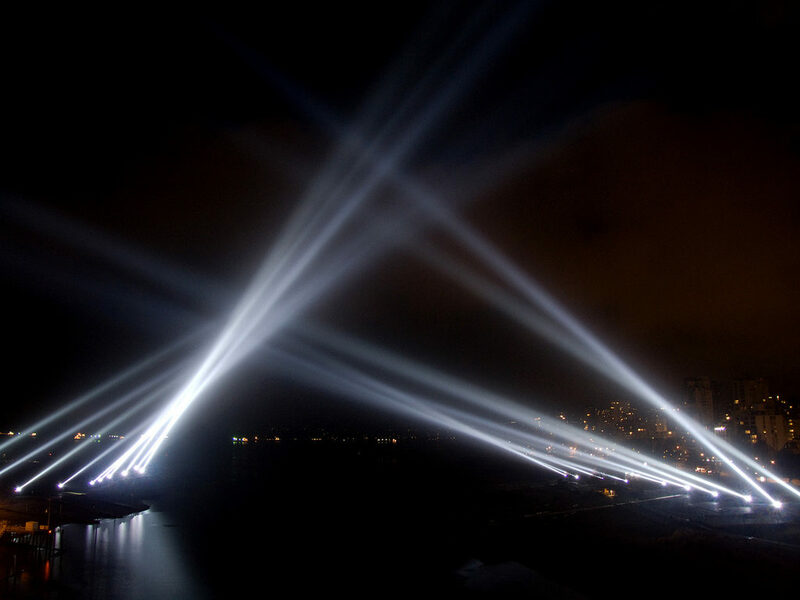 Every six seconds the searchlights would orient themselves automatically and three webcams would take pictures to document a participant’s design. An archive page was made for each participant with comments, information and watermarked photos of their design. A notification email message was sent once the archive web page was done. Vectorial Elevation received participants from over 50 countries and all the regions of Mexico. To facilitate access, free terminals were also set up in public libraries and museums across the country. The Zócalo’s monumental size makes the human scale seem insignificant, an observation that has been noted by some Mexican scholars as an emblem of a rigid, monolithic and homogenizing environment. Searchlights themselves have been associated with authoritarian regimes, in part due to the military precedent of anti-aircraft surveillance. Indeed, the Internet itself is the legacy of a military desire for distributed operations control. By ensuring that participants were an integral part of the artwork, Vectorial Elevation attempted to establish new creative relationships between control technologies, ominous urban landscapes and a local and remote public. It was intended to interface the post-geographical space of the Internet with the specific urban reality of the world’s most populous city. Rafael Lozano-Hemmer. Mexican-Canadian electronic artist, works in relational architecture, technological theatre and performance art. His work has been shown in over a dozen countries, including the ARCO art fair (Madrid), the Museo de Monterrey (México), the Musée des Beaux Arts (Montreal), the European Media Art Festival (Osnabrück), Karlstad University (Sweden), Music Gallery (Toronto), Musée du Québec (Québec) and SIGGRAPH”93 (Anaheim). He has been guest editor for Leonardo Magazine and corresponding editor for Mediamatic Interactive Publishing in Amsterdam. His writing has been published in Kunstforum (Germany), Bioapparatus (Canada), Performance Research (UK), Ylem Newsletter (USA), Telepolis (Germany), Movimiento Actual (Mexico), Archis (Netherlands) and other art and media publications. He has been in several international juries and committees, including the Prix Milia d”Or for multimedia publishing in Cannes and ISEA. He has given many workshops and conferences, among them: SAGAs (Munich), Dutch Electronic Art Festival (Rotterdam), Arch Foundation (Salzburg), Viper 98 (Lucerne), Imagina 98 (Monaco), ARCO 93 and 96, Residencia de Estudiantes, Art Futura 95, Universidad Complutense (Madrid); Milia 95 and 96 (Cannes); Universidad Politécnica and Fundación CAM (Valencia); UNAM, UAM, CONACYT, National Arts Centre and Anthropology Museum (México DF); Tecnológico de Monterrey (Monterrey); Concordia University and Oboro Gallery (Montreal); York University and Ontario College of Art (Toronto). He curated “Arte Virtual: Doce Propuestas de Arte Reactivo” an electronic art exhibition in an old subway station in Madrid. He organized and moderated the Fifth International Conference on Cyberspace, 5CYBERCONF, in Madrid. He is the coordinator of the “Life X.0” art and a-life competitions. He has been a resident artist twice at the Banff Centre for the Arts in Canada. His pieces have been awarded honorable mentions for interactive art at the 1995 and 1998 Prix Ars Electronica and a Golden Nica in 2000. He won the “Best Installation” award at the Interactive Digital Media Awards in Toronto, received a Cyberstar award given by German TV WDR and the VR centre GMD in Bonn and was recently awarded a distinction at the Webby awards in San Francisco. His “relational architecture” pieces have been presented so far at the Ars Electronica Festival 97, the 3rd Internationale Biennale Film und Architektur in Austria and the Zocalo plaza in Mexico City for the Millennium celebrations. His next pieces will be presented in The Havana Bienale and in the Cultural Capital of Europe Festival in Rotterdam. He holds a B.Sc. in Physical Chemistry and a minor in Art History from Concordia University in Montréal.